Where to start is the question, I’ve always suffered with “bad” hair, I’m just glad that straightening became big when it did (I was about 16). Before then, my hair used to be curly..well, I say curly..my mum would NEVER let me step outside the house with my hair curly because it wold mean it wouldn’t be brushed. She’d sit me down and make me comb all the curls out so all I had was a ball of frizz on my head. I told her time and time again that if she let me keep the curls in, I’d just spray the front and it would sit..she wouldn’t believe me. I gave up on Frizz Ease because it was expensive and did nothing. I thought getting a cheap straightener was the way to go..clearly it wasn’t because it did NOTHING. I remember once I straightened my hair with it and it looked gorgeous, then I had to get something out of the drier and it puffed up, I was so angry. Nobody told me that humidity would make it frizz. I remember when I was 15, I had a wedding to go to and I decided to spray a comb with hairspray and brush it through my hair so it went straight..it worked well enough until I fell asleep in the car. I woke up in Birmingham and my hair was sticking out at 90 degree angles..FAIL. 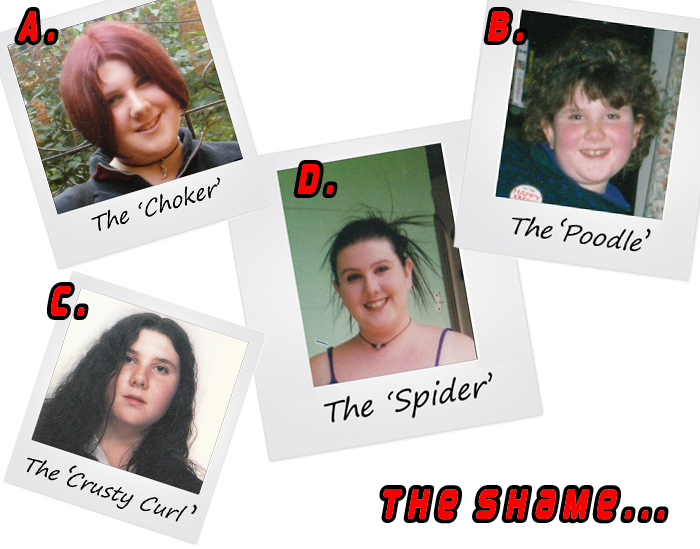 I also had the spider hair but it was a way to get out of straightening my whole head of hair (it used to take 2 hours back in 2000), I’d just tie it up, straighten the front and the bits sticking out. I like to think that now I’m an expert at getting my hair straight and having it curly but it’s taken me a bloody age to figure it out. My cousin is 10 years younger than me and she’s had good hair since she was 11, it’s because me and her sister have suffered so she no longer has to! You are my absolute hero for posting these! The “spider” is my favourite. I did a and d! Ooohhh i loooved the spider!! I also did a brief chavesque gelled back bun (ala sport spice) but thats not so bad.. more was the elasticated trakkie bottoms with the stripes down the side and crop top that went with the hair! The 90s were so wrong!!! Back in the day when Carnaby st was still full of punks and my mum let me get my ears periced 4x with gold hoops… i mean eww!!! I’m loving the poodle! I have had quite a few shameful hair dont’s although I blame my mum for most of them since my nan was a hairdressers she somehow this (by proxy presumably) also gave her hairdressing qualifications?? Baffling, I looking like a complete dipstick with a wonky fringe from the age of 3-10 years old before I finally managed to run away when she came at me with the scissors! I’m growing a bald spot.. well more correct term is losing hair and starting to get very short hair in the back, because my hair is so fine it tangles so easy. So when i wake up I have literally a birds nest in the back. This have resulted in me just combing it some mornings and then it have broken off. So my normal hair is shoulder long and the one in the back is around maybe 5-8 cm so I could use some emergency surgery on the hair. It have taken me around 10 years to get shoulder long hair.. so not only is it fine and tangles easy but it also grows so slow.. Thats my hair of shame… if its a shame? My secret shame……… Sun In. I was about 14 and wanted blonder hair, a bottle of Sun In was cheap and after applying I blasted my hair with the hair dryer (my poor hair!). I thought I looked great but looking back, my hair was orange. So embarassing!! I’ve since discovered that I look a lot better as a brunette. My Mum however seems to be having a midlife crisis, I went round the other day and saw a bottle of the dreaded Sun In!! Hahaha oh god I just spat Digestive biscuit all over my keyboard. Thanks, minger! I don’t think I’ve ever really had an exceptionally bad ‘do. When I went through my bicurious stage I had a bit of a lezzer haircut to go with it – short as hell at the back (even shaved a bit) and kind of like an assymetical bob. It was actually kinda cool but looked SO BAD with my chubby little face, haha. Oh and when I was about 8, I had a gorrrgeous Impetigo infection all the way down my parting. That was hot. The worst hair nightmare i had was in my fourth grade photo where it is now imortalized forever. I wanted to have two pieces in front that hang down and were curled. However i took sections much larger than i should have, and with my thin hair the curls fell out almost instantly. That being said i still thought i looked “hot” when in reality i just looked like a dog with long floppy ears. This is my favourite blog post, by anyone, EVER. Awesome!!! Well, to my shame, I had a soggy looking perm from the age of 10 to 16, and i used to get the quiff at the front as high and rock-hard as I could with Nova hairspray!! I don’t know how we used to dare smoke- naked flames around hair like that!!! We’ve all been there haven’t we? I’ve had countless bad hair days and loads of photos to prove it. I got a perm too. But at uni at 22 when I was clearly old enough to know better. ha ha.